Back in July, following the panel for Rogue One: A Star Wars Story at Star Wars Celebration Europe, members of the SWU team gathered at our booth to record a special episode of The SWU Podcast in front of a live audience. One of listeners that day, Rob Gower, shot some video of us recording the podcast. 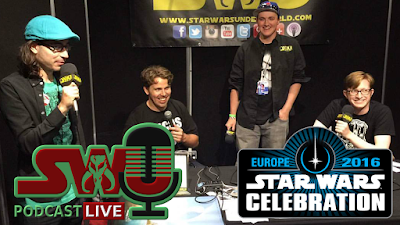 Check out the video below, featuring myself (Dominic) and my co-hosts Chris Seekell, Ciaran Duggan (of The Clone Wars Strikes Back), and our special guest Steele Saunders (of the Steele Wars Podcast) discussing the panel, the sizzle real, the poster, and more! You can listen to the entire episode from Celebration here. Huge thanks to our friend Rob for shooting and editing this video!